(April 16, 2019) – Hallo, Lionsbridge Football Club fans! 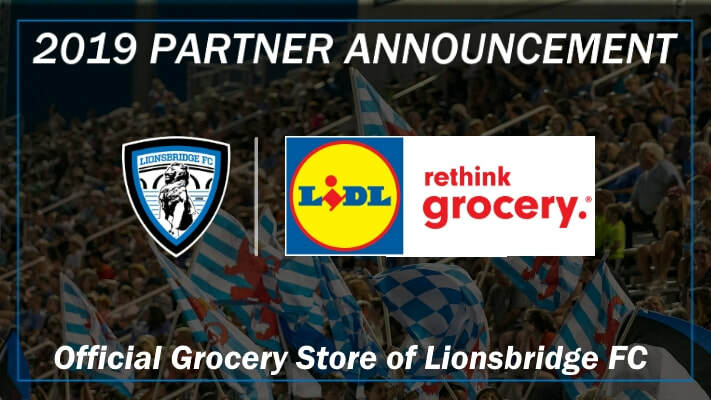 Lionsbridge FC announced a new partnership on Tuesday that will see Lidl become the official grocery store of Lionsbridge FC. As part of the partnership, Lidl and Lionsbridge FC will conduct a food drive at the team’s July 13 game at Pomoco Stadium to benefit the Peninsula Foodbank. Selected players will make in-store appearances at Lidl’s area locations during the season where fans will have the opportunity to get autographs, take photos and win Lionsbridge FC tickets and merchandise. In addition, Lidl will add to the Lionsbridge FC match day experience at Pomoco Stadium with games, activities and giveaways in the Fan Festival Zone and a halftime contest where fans can win free groceries from Lidl. “We are so pleased to add Lidl as our newest partner and they are a terrific match for Lionsbridge FC. We are both planting roots in the community and continuing to grow. We look forward to making a positive impact in the community together and creating awesome experiences for fans and customers,” said Lionsbridge FC co-founder Mike Vest. Lidl joins Chick-fil-A, Riverside Health System, Planet Fitness, Financial Security Group, All-Pro Tactical, Buffalo Wild Wings, Burger Theory, Clancy & Theys, Cox, Holiday Inn, Kwolity Productions, Lightner Enterprises, Mosquito Joe, Parkway Printshop, Signs by Tomorrow and Space Walk as the club’s 2019 season sponsors. Lionsbridge FC has sold more than 500 season tickets for the 2019 season, almost double the year-over-year pace from the 2018 inaugural season. Season Ticket Jerseys and Season Ticket Wristbands are available via the team’s website, LionsbridgeFC.com. Group tickets (20 or more) may be purchased by calling 757-656-9659. Lionsbridge FC will kick off its 2019 USL League Two schedule with three road games before returning to the Peninsula on May 22 for the first of 10 home games at Pomoco Stadium. Lionsbridge FC competes in USL League Two, the top amateur men’s soccer league in North America. In 2018, Lionsbridge FC led the Eastern Conference in attendance with nearly 1,400 fans per game. Four Lionsbridge FC players from last year’s team signed professional contracts in the United States, England and Sweden. The roster is comprised of top locally-based collegiate and international players. Home games are played at Pomoco Stadium on the campus of Christopher Newport University and are preceded by a two-hour community festival with bounce houses, family entertainment, music, beer garden and the area’s top food trucks. Home games are televised to a statewide audience of approximately a half-million households on Cox Cable.